I did watch The Snowmen on Christmas Day, and will rewatch and review that in good time. But I have another catch-up review to do first: The Angels Take Manhattan, which I likewise saw at the time but never got round to reviewing because work was so busy and even my watching had slipped about two weeks behind schedule by the time it was broadcast. Time to put that right. I felt that this was a story which made a lot of emotional sense in the way that it dealt with Amy and Rory's relationship with each other, and with the Doctor, and with the close of that story. It also put forward some interesting models for the way that Doctor Who deals with time, had a delicious meta-referentiality to it, and made good use of symbolism and locations. It is completely fair to say, though, as some reviewers did at the time, that the central idea of the Angels' 'farm' at Winter Quay didn't really make sense. The problem with it is that all the Angels seem to do is send people back in time and then just keep them prisoner until they live back to the point they original got sent back from and die of old age. The idea of meeting yourself just before your own death, and being shown that the rest of your own life would be spent trapped inside a single apartment until that moment, is certainly powerfully horrific - but unfortunately it offers no real benefit to the Angels according to what we have been told of how they operate. Surely they would receive the same amount of displaced temporal energy from sending the person back in time whether they then kept that person prisoner at Winter Quay until their death or not? Alternative models which make a bit more sense for the Angels could be suggested, and may be what Moffat was originally thinking of when he came up with the concept. For example, if the Angels exist and maintain the hotel on the same spot throughout the course of several centuries, they could keep sending people back to past generations of Angels, and back and back and back more or less infinitely, thus benefiting from the displaced temporal energy several times over. Similarly, if they sent the person back one year into the past, waited for them to live through that year and then kept sending them back round and round the same short-term loop again, that might also be beneficial to them - although even on that scenario we might well suspect that they simply got the same total amount of temporal energy as they would from shoving the person a whole lifetime back into the past, but spread out over numerous small doses instead. But neither of those models seem to match up with what we actually see in this story. It all feels to me like an idea which got garbled to the extent that it lost its meaning at some point in the production process. Asylum of the Daleks - starts with a voiceover from Darla as the camera pans over the ruins of Skaro, recalling the story of the Daleks and the man who fought them, and whom few still believe in. Dinosaurs on a Spaceship - does not start with a narrative voiceover, but instead in medias res as the Doctor collects Nefertiti, Riddell and finally the Ponds to make up his interstellar gang. The Angels Take Manhattan - starts out with the meta-fictional narrative of 'The Dying Detective', whose male author sets the scene for the episode by reporting how he was commissioned by Mr. Grayle to investigate moving statues in 1930s New York. Gradually we realise that the narrator is telling his own story, and see him experiencing the same fate that waits for Rory later in the episode - being sent back in time only to live just long enough to meet himself again before he dies of old age. For the first half of the season proper, then (not counting the Christmas special), Dinosaurs on a Spaceship is the only episode not to begin with an explicit narrative voice-over in a story-telling format is Dinosaurs on a Spaceship. Who knows why that one doesn't have it - perhaps it was the result of practical production factors, or perhaps it just underlines the 'throwaway' status of that story? But it is clear that narrative frames are extremely important for the first half of this season, and in The Angels Take Manhattan they really take centre stage. The whole episode explicitly deals with the end of the story of Amy, Rory and the Doctor - one which Amy is always eager to hear ("Shut up and read us a story"), but which the Doctor, like every story he finds himself a part of, doesn't want to end ("I always rip out the last page of a book. Then it doesn't have to end. I hate endings.") Their story acquires meta-fictional status through the novel written by Melody Malone, which in turn becomes an opportunity to address the power of stories and issues of pre-destination. Central to this whole episode is the idea that events in both the future and the past, once known, become fixed. Thus when Amy protests that events yet to happen which she and the Doctor have read about in Melody's book needn't come true because "time can be rewritten", the Doctor replies "Not once you've read it. Once we know what's coming it's written in stone." Later on, the same basic issue underpins the dramatic climax of the story. Our heroes have all seen concrete evidence that Rory will be sent back in time by the Angels and die in front of them in the Winter Quay building (which from their point of view involves both future and past events), and the Doctor believes that the very act of their knowing about it makes it inevitable. It is only Amy and Rory's desperate (literal) leap of faith from the apartment building roof which destroys the hold of that narrative. Set against some of the observations I have made previously about how Doctor Who deals with the intersection between time travel and history, this is fascinating stuff. It is basically New Who's explicit articulation of an unwritten rule commonly employed in Old Who, which I have discussed here in a review of The Highlanders. As I have said there, what the Doctor really means when he says to Barbara that "you can’t rewrite history – not one line!" (and what the producers of Doctor Who mean in conveying that line to their audience) is that you can't rewrite known, recorded earth history, but you can happily change events in the past as long as that has no traceable effect on the historical record known to a late 20th century TV audience. Here, the main 'record' is a fictionalised novel reporting future events, rather than a 'history book' recording the past, but the principle used is exactly the same. The isn't to say the same principle remains consistent throughout all of Doctor Who - that, of course, depends on the demands of individual stories and the whim of whoever is in charge of the programme at the time. But this basic central idea will always be pretty important to Who I think, especially in relation to recorded Earth history, and it is nice to see it being re-explored here. I was particularly tickled this time as well to see epigraphic evidence being included within its remit - specifically through the use of Rory's (and later also Amy's) tombstone, shown on screen at the same time as we hear the Doctor's words, "Once we know what's coming it's written in stone." This shows a broader sense of historical evidence than the 'history books' constantly referred to in Old Who - although to be fair it isn't the very first time epigraphic evidence has been used in this way in Doctor Who. The London Underground tube station sign used in The Mysterious Planet (the first of the Trial of a Timelord stories) to help Peri and Doctor work out where they are is another example. Also intriguing is the final coda to Amy and the Doctor's story, in which she asks him (through the last page of Melody's novel) to go back to the first night they met and tell the young Amelia the story of what is going to happen to her when he returns. On the terms explicitly re-established in this episode, then, the outlines at least of the whole story which we have been following since the start of season 5 have for her been pre-known, and therefore fixed. It might be interesting to go back and rewatch the whole lot with that knowledge - although I'm sure the Doctor left plenty of details out in order not to 'spoil' her too much. It is in Greek lettering, and reads ΥΓΕΙΑ - i.e. Hygeia, daughter of Aesculapius and goddess of health. As far as I could see it was a genuine inscription on the building, not a prop, probably suggesting that the exterior location used for the Winter Quay building was originally a hospital. 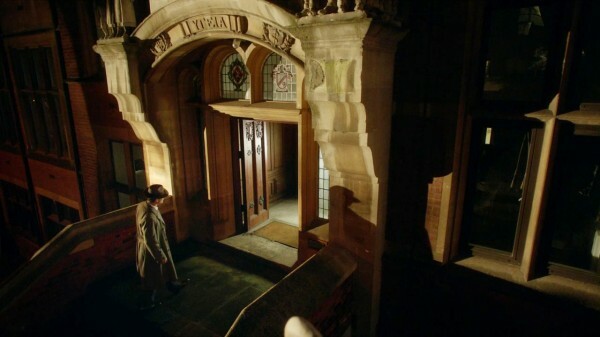 But its clear placement within the shot shows that the production team knew full well what it meant, had chosen this building for that reason and were making the most of it within the story. It is, after all, a source of life and health for the Angels. We also get yet another reference to light-bulbs - a thread which has been going all season and is yet to be resolved - when River asks whether the bulb on top of the TARDIS needs changing. And, talking of the TARDIS, I noticed a shift in established canon regarding its the effects of its translation circuits. River tells Rory that he can read the inscriptions on Chinese vases in 1938, even though the Doctor and the TARDIS are both in 2012(?ish?) because it is a gift of the TARDIS which hangs around. This certainly wasn't the case in The Christmas Invasion, when Rose and Mickey, who had both already travelled in the TARDIS, could not understand the Sycorax while the TARDIS was out of action because the Doctor was still busy regenerating properly. But it does at least now explain how on Earth Nefertiti and Riddell could understand one another after they had left the TARDIS and shacked up together at the end of Dinosaurs on a Spaceship. Ah, thanks for that about the building. Interesting, because the inscription does seem rather incongruous for its current use, doesn't it? I wonder if it was originally the University's School of Medicine? The production history of The Angels Take Manhattan as told in The Doctor Who Companion: The Elventh Doctor, Volume Six suggests that something very similar to what you postulate happened with the Angels' apartment building at Winter Key, with more complex time-looping of characters by the Angels being simplified into something which the programme could afford to record. Agreed; there are several clues which suggest that Doctor Who is not in the best of shapes right now, or at least not enjoying as nurturing an environment as it had a few years ago. The Companion doesn't shed any more light on the thinking or circumstances behind the production gap between the sixth and seventh series, either. Surely they would receive the same amount of displaced temporal energy from sending the person back in time whether they then kept that person prisoner at Winter Quay until their death or not? I thought (though may be wrong) that sending them back actually drained their energy but the people who had been sent back had the temporal energy which they could then use "like a battery". That is sending them back charged them up and then they had the energy which could be used. That would require more storage though -- you'd need to keep several parallel copies of the person. Maybe the longer you send someone back the more energy they aquired. In that case it would be more efficient to keep your rooms full of people who'd been sent back 10 years than people who'd been sent back one year. Actually though, I think the true answer is that maybe they didn't bother to think this all through because they wanted a convenient narrative way to have the scene where "old Rory" meets himself and where the Ponds could live a happy life together and die in old age. Maybe I have misunderstood but it seems a bit inconsistent though because the Tardis can visit New York without problem in 1930 (Daleks In Manhattan) and in 1969 (Day of the Moon). If the problem is travelling to New York and the Ponds realise that, surely all they need to do is to travel somewhere else spacially and let the doctor know where. But pointint out holes in Dr Who is like pointing out holes in a fishing net. It's actually more fun to try to find an explanation that makes sense and is consistent with the episode. you can't rewrite known, recorded earth history, but you can happily change events in the past as long as that has no traceable effect on the historical record known to a late 20th century TV audience. Of course it's all massively inconsistent. Sometimes the Doctor absolutely won't interefere to ensure history takes its correct course, sometimes completely interferes to ensure history takes its correct course (e.g. stops various alien invasions) and sometimes inadvertently causes history to take its correct course (fire in pudding lane for example which the fifth doctor starts but doesn't notice it).